Are your investments and savings destroying rainforests? If your retirement plan is managed by Vanguard, TIAA-CREF, or other major asset managers, the answer may be different than you think. 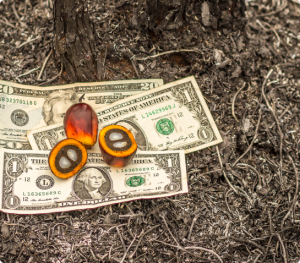 Investments in palm oil–the fastest growing cause of rainforest destruction today–are embedded in our retirement accounts and personal portfolios, and most of us are not even aware of it. U.S. mutual funds have more than $5 billion dollars in palm oil producers, and rainforest destruction is the second biggest driver of climate change after the burning of fossil fuels. That’s why As You Sow and Friends of the Earth have partnered together to create Deforestation Free Funds, a new transparency tool that shines a light on the palm oil-related investments of global asset managers. Deforestation Free Funds empowers you to find out if your money, in the form of an employer-provided 401(k) or a personal portfolio, may be causing tropical deforestation through investments in companies that produce, consume, or finance palm oil. Created by As You Sow and Friends of the Earth, our online database also highlights socially responsible funds that carefully consider issues like the environment and human rights. If you look up your investments and aren’t satisfied, you can find better-rated alternatives and lend your voice to our calls for reform. Don’t wait—start protecting the rainforests now! Check out Deforestation Free Funds today.